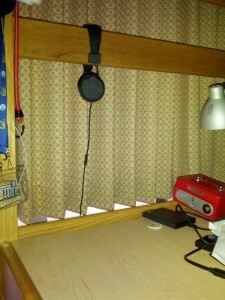 a perfect spot to keep those expensive headphones. Hang them on the horizontal board that’s around eye level when sitting down (look at the picture above). It’s the perfect spot. Your headphones are right there when you need them and also safe from the disaster that is your desk. Admit it. Your desk is a cluttered, paper filled mess. Yeah we know that you’ve been meaning to clean it, but when is that going to happen? Probably not until you leave for winter break. That last thing you want to do is drop a textbook down on your expensive cans or have to shovel mounds of paper to find them so you can watch TV while your roomies sleep. If you have any tricks you use in the dorms to make life easier we’d love to here about them in the comment section.